Caregivers and family members play an important and prominent role throughout the post-stroke recovery process. National Stroke Association is pleased to offer Lotsa Helping Hands as part of our commitment to supporting caregivers of stroke survivors. 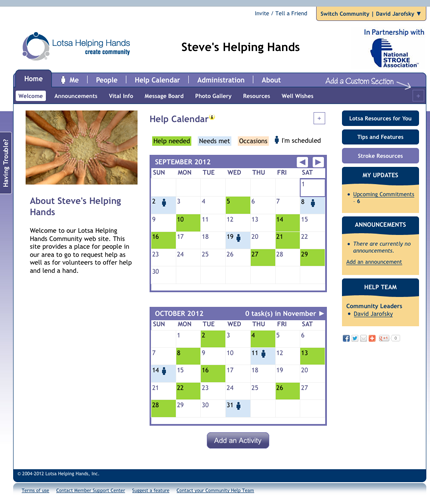 Lotsa Helping Hands powers online caring Communities that help restore health and balance to caregivers’ lives. The service brings together caregivers and volunteers through online Communities that organize daily life during times of medical crisis or caregiver exhaustion in neighborhoods and communities worldwide. The hallmark of the service is the caregiver-focused Help Calendar, which enables members to schedule and sign up for tasks that provide respite for the caregiver including meals for the family, rides to medical appointments, and visits. Members can also communicate with one another through message boards, post personal blogs, share photos, and send well wishes to the family. And Coordinators can safely store and retrieve vital information for the family – from medical and health records to financial and legal documents. Now, when someone asks “what can I do to help?” the answer is “give me your name and email address” – the system takes over and allows people to sign up and start helping.